피렌체, 이탈리아의 프롬나드 | 호스텔월드에서 예약하세요. Promenade is located in the heart of the historical center of Florence, just 40 meters far from Ponte Vecchio and close to most important tourist destinations and places of historical and cultural interest. 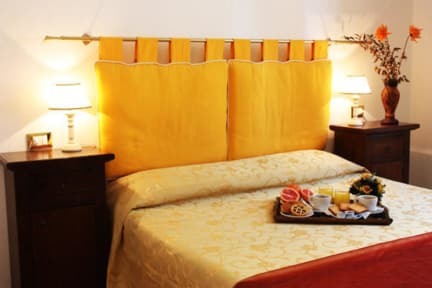 Promenade offers single, double bed or twin, triple and quadruple rooms, with private bathroom, air conditioning ( optional ), heating, LCD TV, Internet WiFi 24/24 hours, room service . 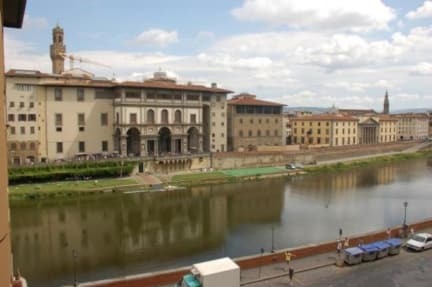 Most of the rooms have a splendid view to the river Arno and the Uffizi Art Gallery. Reservations for rooms with view within the limits available. Among the main tourist attractions nearby, all at 1 - 20 minutes by step from us, we mention the Uffizi Art Gallery, Palazzo Pitti, the Boboli Gardens, the beautiful Piazza della Signoria, Florence Cathedral ( Duomo ) and Santa Croce. Payment upon arrival by: cash, credit card ( Visa, Mastercard, Eurocard, Bankomat, etc ). Check in from : 14:30 - 20:00. For early or late arrivals, please call us or send us a message. For the late arrivals, after 20:00, there is a fee of 25 Euro/room. After 22:00 the fee is 50 Euro/room. Of course, we are flexible and 10-15 minutes of delay does not count. Breakfast is optional. It is not included in the price of the room and can be ordered at arrival. At request, cost minimum 4 Euro/person/day. Taxes not included, Touristic City Tax : 3 Euro/person/day. For luggage storage there is a fee of 10 Euro/day/room. Air conditioned is optional: cost 10 Euro/day/room.